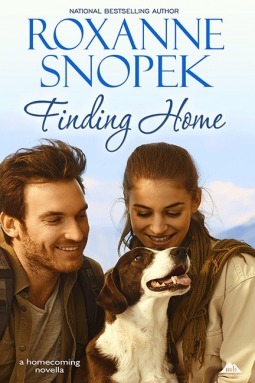 Finding Home by Roxanne Snopek. Publication: September 25th 2014 by Montana Born Books. This is a great story if you want a little light reading that is short and sweet. It has the man who has always loved a girl from high school and never forgot her. He gets a second chance at love and he runs full force to her! The man in this story is what every woman wants; someone who will always be there for you with all your baggage and who loves your child even if the child has special needs. I mean really who wouldn’t want that?! Logan was the football player in high school that every girl wanted. Samara is the girl whom he wanted. Samara’s family moved a lot and just when things were perfect between them. Sam’s father up and moved them without letting her say so much as a goodbye. Many years and one child and widowed woman later, Sam returns with her little girl, Jade to move in. It is a lovely small town where everyone knows everyone else. She chose a house that the kids from the high school that Logan works at, is renovating for school credit. The house isn’t ready and her furniture is coming soon anyway, Sam is always worrying over Jade, thinking she is the only one who can care for her and Sam keeps getting distracted by her feelings for Logan and she finds herself confused and overprotected and anxious. There is more than she can handle at one time. That’s where we find our Prince Logan to rescue her and help her out not because he can, but because he has always loved her and still loves her and wants to help her. I loved the story. The story is easy to follow. The characters are real (with their entire baggage showing). There are mistakes made and apologies given. I love small towns and a tight knight community. This is where everyone is there for everyone else, always providing service when needed. So, if you want a quick, sweet read; one with a Prince Charming, renovating an old home, small towns, special needs kids with a cute little mutt, being there for others, second chances, learning how to let others give you aide, and finding all is ok in the world, then this is the story for you!